Les demonstrating the Wedelen “Shortswing” turn. 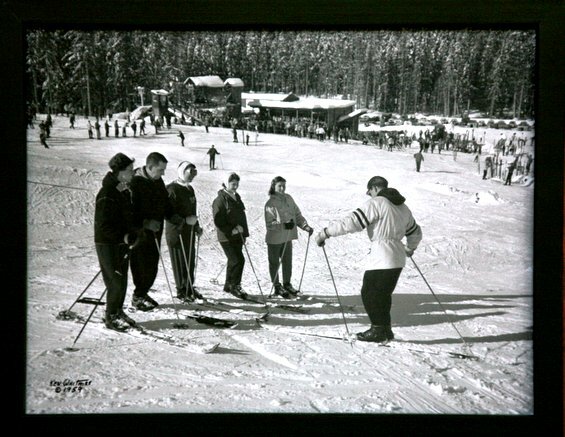 All black and white photos used in this article were taken in the 1950s-1960s at White Pass by Ken Whitmire. In 1945 at age 11 I was introduced to real skis. I received the gift of a pair of new 7-foot Norwegian hardwood laminated skis made by “Splitkein” with toe-strap bindings, cane poles with leather baskets, and a pair of old US Army square-toed World-War-One leather ski boots. I did not like the strap bindings, so I screwed my boot soles directly to the skis, which in my mind gave me much more control of the skis. Then I taught myself to make turns speeding downhill through our family pie-cherry orchard with what I called “Bark Turns”. Ten years later I had skied enough that I began teaching skiing at White Pass (Washington) for the weekend school under Glen Young, the Ski School Director. That same year Glen had hired two Austrian instructors, Ramón Wertzenriemer and Rudy Schabrunn, who had been teaching for Siegfried (Sigi) Engl at Sun Valley, as the first full-time professional ski instructors at White Pass. 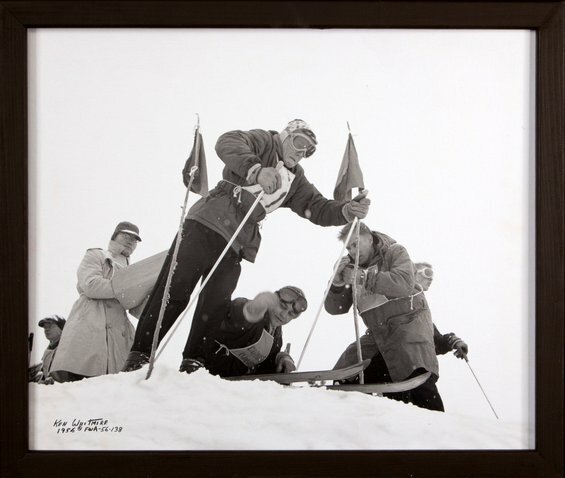 As a condition of their assignment, these two top Austrian instructors were to teach their Austrian Ski Technique to the White Pass Ski School instructors so we would be qualified to teach the system to students during the coming 1955 season. Both had learned the system in Austria from Professor Kruckenhauser. While they only had 60 days in November and December of 1954 to accomplish their assignment, these two gentlemen were tremendous teachers and did an incredible job preparing us. They taught us that the more upright a person stands, the more relaxed they become. The upright position also required less effort to make the skis track or carve. We learned a new style of turning made by thrusting our heels in one direction while letting the shoulders turn in the opposite direction as a counterbalance for the heel thrust. The system was coined “Wedeln” or “short swing” with a “reverse shoulder rotation”. What we were learning would change ski techniques all around the world from 1955 through the early 1970’s. We became part of the movement that taught U.S. skiers how to ski difficult slopes with pleasure and excitement. 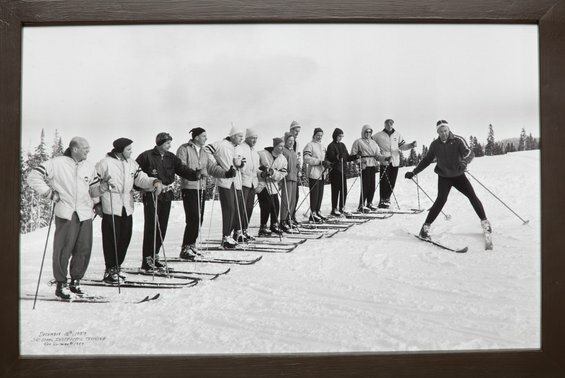 The New Official Austrian Ski System, published in the early 1950s in Austria and later in 1958 in the United States, led to the beginnings of the American Ski Technique and the PSIA Ski Teaching System used by most ski institutions in the United States today. Sun Valley and Aspen, as in the past, became the proving grounds of its worth as the world’s best skiers flocked to their slopes. Ski School Director Glen Young breaking down a turn for White Pass instructors. 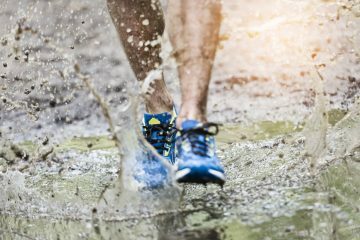 Les, in the middle of the lineup, is jumping at the reins to put this lesson to good use. I was personally committed to learning the new Austrian Ski Teaching Technique from these two Austrians. I also wanted to adopt their skill at transmitting these movements to others. They were masters at transmitting the vision of a turn into a student’s mind and at then dissecting a turn into parts that the body could more easily master. 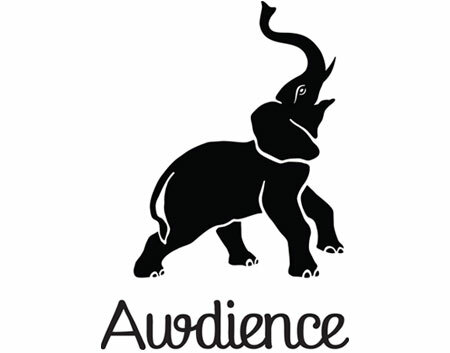 This whole learning process changed my internal perception of myself. I now believed I could communicate the system to other instructors, instilling in them the confidence that they, too, could inspire students to successfully master the Technique. All of our instructors were inspired by the improvements the Technique made in their own skiing and teaching ability. During this same period, my professional career at the White Pass Resort progressed as I rose from a weekend class instructor to a full-time professional Instructor to teaching instructor clinics as the Ski School Supervisor to the Director of the Professional Ski School. 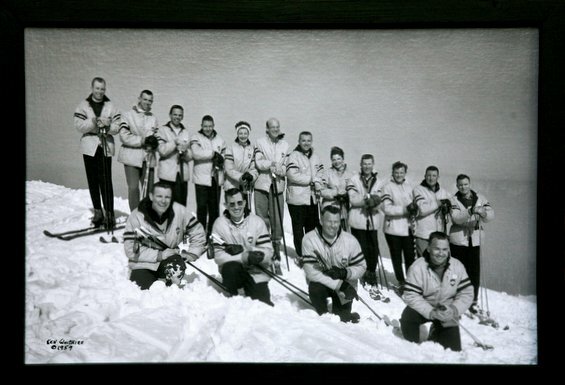 In 1959, I left White Pass to join forces with Glen Young, Peter Erler, Bill Hancock, and others to form Ski Professionals Incorporated (SPI) at Hyak, our first home base on Snoqualmie Pass. SPI held its first open teaching clinics in the fall of 1960. SPI was the first ski school in the USA to offer a fully organized teaching curriculum based on the manuals of the new American Teaching Technique. The clinics were open to all ski instructors in the PNSIA with credits toward Full Certification. The clinics were open to all ski instructors from Northwestern ski schools and to any others interested in learning how to teach skiing. From these clinics, SPI hired its 1st year teaching staff of 30 instructors. 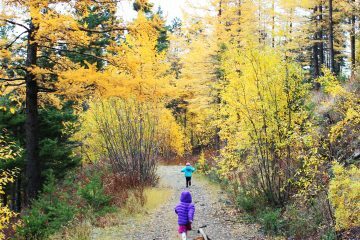 SPI grew very rapidly through the 1960’s and opened schools at Ski Acres, Snoqualmie Summit, Alpental, Stevens Pass and Crystal Mountain. It managed a staff of over 250 and taught over 4,000 students annually. White Pass Ski School with Les in the back row (4th from the right). In 1964 I left SPI and accepted the Directorship of Ski Marina Ski School, owned by Ski Marina, Inc., a retail boat and ski store in Bellevue. The school was headquartered at Snoqualmie Summit. It was here I met Lenore Lyle and Wilma Weckworth, who were the school’s supervisors. These two women were the heart of the ski school and the most accomplished skiing demonstration professionals in the school. They helped to smoothly introduce the new American Technique and our instructors became exciting teachers to their students and to the ski world. Besides working with these women another milestone of working for SMSS was that I met my best friend and second wife, Diane, who I shared 37 years of life with before she died of cancer in 2004. As other schools adopted the American Ski Teaching Technique, it was refined, published, and incorporated into the newly formed Professional Ski Instructors Association of America, (PSIA). With the majority of American ski schools joining the new recognized PSIA teaching program, it guaranteed continuity in ski instruction throughout the United States. For the first time vacationing skiers could travel to different ski resorts around the country and expect continuation of their ski learning experience and enjoyment on any mountain. It also became apparent that professionally managed ski schools were a central source of revenue for all resorts. Ski School 10 Week Lesson Packages were bundled with bus transportation and lift passes and marketed directly to local school systems. Professional instructors became the ambassadors of resorts, which included not only teaching our students how to ski but how to safely interact with each other while skiing a resort. I retired from skiing professionally in 1972, went back to school, and became a consultant in the investment world. Today at age 78, however, as I look back on my skiing life those may not have been the years earning me the most money but they were the ones I enjoyed the most. It is clear to me now what an evolutionary time this was in the American ski industry and how fortunate I was to be part of such an interesting and historic era of our sport. 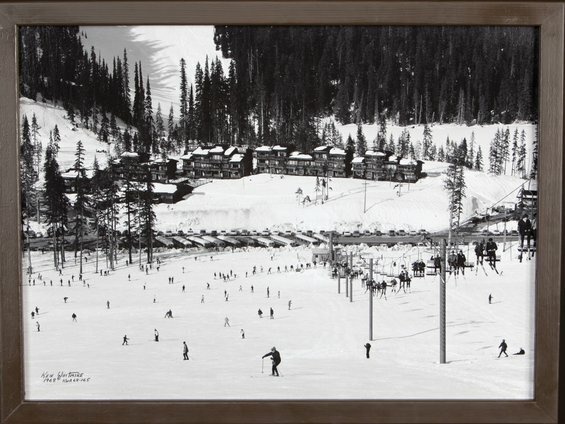 Historians have attributed the early 1950s through the 1970s as the time when the American Skiing Industry evolved from local ski areas into the modern ski resorts of today. Europe, (Austria, Germany, Italy and France) had already developed ski areas into world recognized resort destinations supported by chair lifts and gondolas for uphill mass transportation. 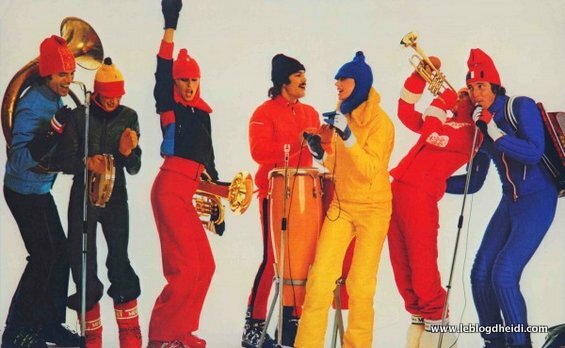 Ski trends in the 1970s included wearing yellow jumpsuits, holding tubas, and playing tambourine with your ‘mates. Did Les leave the ski world just in time? Or, waay too soon? The introduction of the new “high speed” double & triple chair lift replacing the single chair and rope tow as the first major improvement in uphill transportation, followed by the gondola. Ski area management discovered that the investment in a high-speed chairlift increased the area’s transportation capability by 1,500-2,000 skiers per hour, which would easily pay off the capital investment. The timing of the Riblett Chairlift Company operations in Spokane provided a major boost to the American ski industry because it was the only major manufacturer of a chairlift product at the time that was “Made in the USA”. This period was instrumental to major changes in equipment. The introduction of the “Release Ski Binding” reduced injuries. New ski designs with side camber gave skis more edge contact and more control in carving turns. Then came metal skis, then a combination of metal, fiberglass with wood cores. Of course the marketing of the new stretch ski pants fabric instilled the new “Hollywood Mountain Clothing Style”. During this same period, the technology of ski teaching made major changes from the Arlberg Technique to the Austrian “Wedeln” Technique into the writing and adoption of the new American Ski Teaching Technique “Short-Swing” and the forming of the Professional Ski Teachers Association “PSIA” and Certification Program. Post-Postscript: One just can’t recall the memories of special events without giving credit to those people that contributed to the professional ski industry during this period. That included important names such as WP & SPI Director Glen Young, WP & SPI instructor Floyd (Bill) Hancock, WP Instructor and Professional Photographer Ken Whitmire, Austrian ski instructors; Peter Erler, Siegfried (Sigi) Engl, Ramón Wertzenriemer, Rudy Schabrunn, Pepi Gramschaumer, Pepi Stiegler, Americans; Jim and Lou Whittaker, Cory “Corky” Fowler, and of course Warren Miller and Swedish Gold Metal winner, Stein Eriksson, and many more. 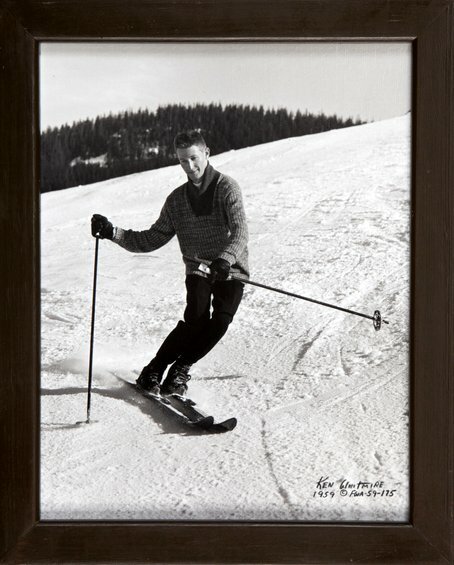 Editor’s Note: For a full history of Sun Valley alpine skiing and some photos of dashing young skiing icons, visit this website.